Cincinnati, Ohio : Writer's Digest Books, c2007. A book about beginnings, how to plan and execute a great start to your novel. There's a lot of good advice here. But it's very wordy, perhaps twice as long as it needed to be, and many of the examples of amazing beginnings don't seem to "hook" the way the author advertises. This is a useful book to skim. I got Hooked free on the Amazon store in some promotion or other -- possibly something about NaNoWriMo -- along with a bunch of other books. I don't know exactly why I started reading it; maybe it was the shortest. Anyway, it's the second non-fiction book in a week that's been surprisingly compelling. It's really about writing the first chapter, especially the first paragraph, or even more specifically, the first line of a novel. It's about exactly how to get your readers hooked. And it's really, really interesting. Almost every chapter gave me something to think about, and it uses examples to help the reader understand exactly what its driving at. If you suffer from Explaineritis when you write your opening lines, this book will cure you. Edgerton not only drives home the point that you must have an attention-grabbing opening, he shows how having this can help you more easily write the rest of the story. This is a terrific book on the craft of writing. This book is a must read for all writers whose stories have an arch, be it fiction or creative nonfiction! Fabulous examples of what works and clear explainations of why it works. Remember the first time you went fishing? You tagged along with Daddy or Grampa or some kid bigger’n you, and there you were with a real pole and a real line and a real hook, and you were gonna catch something, by golly, and you did — seaweed. 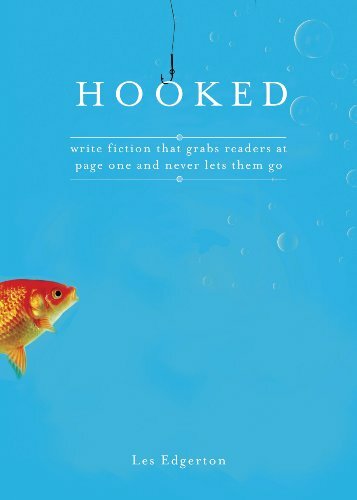 In Hooked, Les Edgerton shows aspiring authors how to land the big one — a full reading by an agent or editor. You bait your hook with a strong opening that pulls the reader right into the action — right where the trouble begins. You set your hook with characters whose deeds evoke sympathy and empathy, and just enough setup and back story for a fascinating setting. Then you play the reader with active scenes and dialogue that show your characters’ struggles to get out of trouble, until the reader is dying to jump into your landing net and find out how it all ends. Edgerton’s writing style is more concise than mine — probably because he writes fast-paced stuff like short stories and screenplays — but he did help me tighten up my first foray into writing fiction, and I read him again when it was time to edit my finished novel. I enjoyed reading an opening scene he set in Fort Wayne, and I liked his conversational tone. I think you’ll like him, too — even if your writing genre is carefully crafted grocery lists — because if you love books, Les Edgerton will give you a greater appreciation for the well-turned phrases that get you Hooked. Possibly the most important book you'll read about writing. Most writers would agree the beginning of a story is the most important part. That's where the reader gets "hooked" and continues read on or abandons the book. In Les Edgerton's book, Hooked - Write fiction that grabs the reader at page one and never lets them go he describes in broad strokes, fine strokes and with examples how to achieve what his subtitle proclaims. According to Edgerton, you can't write the opening until you know in significant detail who your protagonist is and what the story is about. To do this you must first identify your hero or heroine's "storyworthy problem", that would be the problem that is just below the surface and is gradually revealed as the story unfolds. From that discovery, and Edgerton urges you to drill deep to find out what's really bugging your protagonist, comes the inciting incident. This is where the story begins, the moment where the status quo is upset and the protagonist sets about to resolve it. The inciting incident presents the first indications of the bigger issue, the storyworthy problem. Don't start with backstory - bringing the reader up to date on your protagonist's life, start with "trouble" - an incident presented in an action filled scene that incites your protagonist and reader to carry on to resolution. A provocative opening sentence, an exciting inciting incident giving a glimpse at the storyworthy problem and you're on your way. Complicated? Maybe, but Edgerton hammers it home again and again (with examples). Hooked may very well be the most important book you'll read about writing. Edgerton writes in non-academic, easy to understand language, includes entertaining examples and even gives agents and editors the last word on the most common mistakes made in the manuscripts they see and, you guessed it, a bad beginning ranks right up there. Absolutely brilliant insight into what makes mainstream/commercial fiction work, includes lots of examples. I bought this book because author Chris Strayln said, in an Amazon review, that it revolutionized the way he wrote beginnings. So I got a sample of Strayln's book, This Time You Lose, and it was about the most exciting beginning I've ever read. Well, Hooked didn't quite live up to that recommendation. My review meter alternated between 2 and 4 stars while I was reading. In summary, he's got a few great ideas, but he goes over them and over them. He could have gotten his points across in about 40 pages. "A few days before Thanksgiving I get a terrific recipe from the Turkey Hotline Lady while Dyna and I make love." He then says "What a superb opening! Who could possibly resist reading on?" Me. I could resist. He gushes about a lot of these, and often tries to fit the opening to his ideas even if the match isn't that close. "The truth is, many books are getting lost in the mix, and this is largely due to the fact that there are still writers churning out a product written in a style and with a structure my son Mike would most likely describe as being 'So five minutes ago.'" This is from a book on how to write. "The truth is" "Largely due to the fact that." Sheesh. "Many books fail because of their antiquated style and structure." But, as I said, there are good ideas, and I made changes to my opening based on his suggestions. Those changes improved my book. Just be prepared for a long slog. The focus of this book is on the first paragraph, scene or chapter of a novel or short story, and how important it is to get it right. To grab the attention of an editor, or indeed a reader in a shop, the first page must hook them and make them want to keep turning pages. The author establishes the difference between a ‘story-worthy’ problem and an opening problem. There are some interesting points about plot development, and the importance of solving an initial difficulty only to find oneself in a new one. My only slight frustration is that the books cited as examples were mostly ones I’d never heard of, many of them in the thriller or men’s fiction genres. Not unreasonable when the writer is a man, but the kind of books I enjoy writing, often don’t seem to follow this kind of pattern.